This is the true story behind Wall Street legend Richard Dennis, his disciples, the Turtles, and the trading techniques that made them millionaires. What happens when ordinary people are taught a system to make extraordinary money? Richard Dennis made a fortune on Wall Street by investing according to a few simple rules. Convinced that great trading was a skill that could be taught to anyone, he made a bet with his partner and ran a classified ad in the Wall Street Journal looking for novices to train. His recruits, later known as the Turtles, had anything but traditional Wall Street backgrounds; they included a professional blackjack player, a pianist, and a fantasy game designer. For two weeks, Dennis taught them his investment rules and philosophy, and set them loose to start trading, each with a million dollars of his money. By the time the experiment ended, Dennis had made a hundred million dollars from his Turtles and created one killer Wall Street legend. 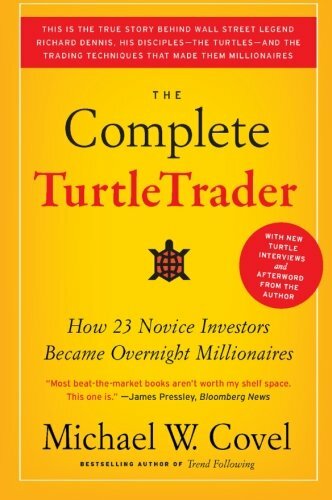 In The Complete Turtle Trader, Michael W. Covel, bestselling author of Trend Following and managing editor of TurtleTrader.com, the leading website on the Turtles, tells their riveting story with the first ever on the record interviews with individual Turtles. He describes how Dennis interviewed and selected his students, details their education and experiences while working for him, and breaks down the Turtle system and rules in full. He reveals how they made astounding fortunes, and follows their lives from the original experiment to the present day. Some have grown even wealthier than ever, and include some of today's top hedge fund managers. Equally important are those who passed along their approach to a second generation of Turtles, proving that the Turtles' system truly is reproducible, and that anyone with the discipline and the desire to succeed can do as well as—or even better than—Wall Street's top hedge fund wizards. In an era full of slapdash investing advice and promises of hot stock tips for "the next big thing," as popularized by pundits like Jim Cramer of Mad Money, the easy-to-follow objective rules of the TurtleTrader stand out as a sound guide for truly making the most out of your money. These rules worked—and still work today—for the Turtles, and any other investor with the desire and commitment to learn from one of the greatest investing stories of all time. If you have any questions about this product by Michael W Covel, contact us by completing and submitting the form below. If you are looking for a specif part number, please include it with your message.